When we remodeled our kitchen, we were in the market for a lot of things including a new sink and faucet. 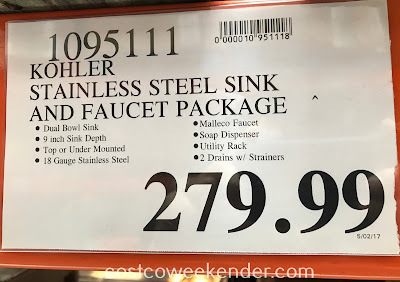 I wish I had seen the Kohler All-In-One Stainless Steel Sink and Faucet Kit at Costco. A good quality kitchen faucet by itself can run you over $200. A large sink can also run you another $200. For under $300 you get the Kohler All-In-One Stainless Steel Sink and Faucet Kit. As an added bonus, you also get an expandable utility rack. We had to buy ours separately from Amazon. And from a name like Kohler, you really can't go wrong. And you even get a couple of sink strainers. This kit really does come with everything you need in a kitchen sink...except maybe the hassle of having to hunt down the individual items yourself. In our home, the kitchen is by far the most frequently visited room in the house. And since we cook often, the sink and faucet get used quite a bit when doing food prep or washing dishes. So get the trusted name in faucets and check out the Kohler All-In-One Stainless Steel Sink and Faucet Kit. 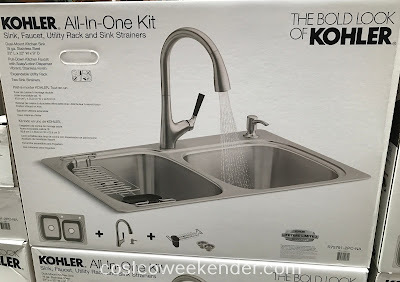 Kohler All-In-One Stainless Steel Sink and Faucet Kit: beauty and function for the main room in your home...the kitchen!